What Else Can I Expect from an Online Bachelor's in Child Development Program? What Can I Do With a Bachelor's in Child Development Degree? Online bachelor's in child development programs emphasize the cognitive, social, and psychological growth of youth, from infancy through adolescence. In each developmental stage, growth is understood through the lens of the cultural and societal influences that surround the child. Graduates of online bachelor's in child development programs are equipped for careers devoted to the growth of children in their care. They are prepared for careers as probation officers, counselors, managers or supervisors in a child service business, and educators or administrators in a school. Preschool education is a popular career path for graduates. The U.S. Bureau of Labor Statistics (BLS) projects a 7% increase in preschool teaching positions through 2024. This guide is designed for aspiring preschool teachers and child development professionals. Online bachelor's in child development programs explore learning and growth in the context of developmental milestones. Core curricula in typical child development degrees online begin with an examination of the cognitive, behavioral, psychological, and physical changes that take place at each stage of development. Cultural and social elements that influence these processes are also explored, laying the groundwork for students to serve as advocates for children in their care. Coursework and supervised practical experiences prepare graduates for an evidenced-based approach to the design, implementation, and administration of effective programs for children and youth. An online degree in child development offers concentrations geared toward individual career goals. Concentrations emphasize skills and best practices that are specific to career paths like teaching, counseling, and administration; some programs provide a pathway to teacher licensure. Most programs will prepare students for graduate studies. Additional field experiences may be required in a concentration area, and some schools offer thesis options instead of a practicum. A bachelor's program will offer professional certification or prepare you to take certification exams. You have many options for online bachelor's in child development degrees. Once you know what you want out of a program, it will be easier to choose one. Pennsylvania State University offers a bachelor of science in human development and family studies that focuses on improvement across the human lifespan, from childhood to old age. Students explore the role that surroundings play on human development, from work to school to community to family, with a focus on evidence-based assistance services and the role they can play in improving lives. The program also provides students the skills to navigate human services and social institutions, advocating for change through effective policies and programs. Students have the option to arrange their degree plan around certain professional certifications and milestones, allowing them to begin improving their career prospects and service potential even before graduating. Penn State's online degree in child development also includes an internship at a local human services organization, allowing students to gain experience through hands-on applied learning. Founded in 1820 in Tuscaloosa, the University of Alabama is the oldest and largest college in the state. For students interested in an online child development degree, UA offers two options: a bachelor of science in human environmental sciences, early childhood education with a concentration in early childhood development and a bachelor of science in human environmental sciences, human development and family studies degree. Both train students to understand the development of children from birth to age eight. The programs focus on child development in a cognitive, emotional, physical, and social context, and places particular emphasis on parent-child relationships. Program graduates are prepared to design and implement preschool education programs, helping both children and parents interact effectively and address life problems. UA's human development and family studies program is Intended only for students who work at Head Start agencies, while its early childhood education degree is open to all applicants. Founded in 1861 in Seattle, the University of Washington is one of the oldest colleges on the West Coast. The school’s bachelor of arts in early childhood and family studies is relevant both to students already working in the field and those looking to enter it. Based on the latest research in childhood development, the program trains students to improve the lives of both children and their families, emphasizing healthy development and academic success. Students pursuing the child development degree online at UW choose from two degree pathways: one for teaching and learning settings and one for nonprofit and policy settings. Graduates are prepared for a variety of careers, including social and health services, community support, child protective services, and education. Online students must have at least 70 transferable quarter credits before entering the program, and graduation requires 180 credits total. Most students complete the degree within two to three years. Located in the city of Corvallis in Oregon's famed Willamette Valley, Oregon State University is a respected Pacific Northwest college that also boasts a highly ranked online education program. OSU's bachelor of science in human development and family sciences offers a concentration in childhood development, giving students the skills to support positive behaviors in early childcare settings and participate in programs supporting families and children. The school also offers a dual degree option, allowing students to combine childhood development with education and earn dual licensure for both pre-k and elementary school teaching. Many students also choose to add a minor to their degree, which can increase job prospects. Common minors that combine with the child development degree online include anthropology, business, public health, and sociology. Graduates often find careers as preschool teachers, family support workers, curriculum writers, and policy advocates for early childhood programs. Colorado State University is based in Fort Collins, Colorado, but the school’s online programs offer in-state tuition to residents of any U.S. state. CSU's online bachelor of science in human development and family science is an interdisciplinary degree that combines theories of human development with biology, psychology, social work, and sociology, providing students with a versatile education applicable to a range of human services careers. Students in the program choose from five distinct concentrations, with the option to specialize in up to two based on professional interests: early childhood professions, leadership and entrepreneurial professions, pre-health professions, prevention and intervention sciences, and human development and family studies. Students in CSU's online child development degree program also work with an adviser to pursue early childhood director qualifications, which meet Colorado state requirements for early childhood education credentials. Arizona State University’s Tempe location is the largest of the school’s four locations, with a total student body of more than 51,000. A significant portion of that enrollment comes from online learners, and ASU ranks as one of the most innovative online schools in the country. ASU's online bachelor of science in family and human development focuses on development from infancy to adulthood. The degree emphasizes the formation of families and family dynamics along with factors that lead to both family development and dissolution, giving students an in-depth perspective on subjects including marriage, parenting, ethnicity, work, and culture at large. In addition to specialized studies in family and childhood topics, students earning their child development degree online also gain skills in research methods, written communication, active listening, and even statistics. Program graduates are prepared for careers in counseling, law, family and developmental sciences, medicine, social work, and human services. Appalachian State University offers more than 150 undergraduate and graduate programs. It boasts an enrollment of over 19,000 with 1,274 distance learners. Appalachian’s online bachelor of science in child development-birth through kindergarten program blends asynchronous and synchronous classes. ASU’s program is only available to transfer students, requiring a minimum of 30 transfer credits and a cumulative GPA of 2.25 for admission. This online degree in child development leads to “A” licensure, a dual certification in education and special education in North Carolina. The degree requires a minimum of 122 hours with 57 provided by Appalachian. The remaining 65 credits should be completed before admission to the program, which can be taken either at Appalachian or another accredited university. Students take six to eight hours per semester, finishing in seven semesters plus one semester of student teaching in a North Carolina public school. Based in Hayward, a city near San Francisco, California State University, East Bay also operates campuses in Oakland and Concord, along with a range of fully online programs. The college’s bachelor of arts in human development with an option in childhood development is a degree completion program, primarily intended for community college students who have already completed an associate’s or equivalent and wish to pursue a bachelor’s. The online child development degree is interdisciplinary, synthesizing theories and methodologies from diverse disciplines such as biology, linguistics, and sociology. Students explore human development from a cultural, emotional, physical, and social perspective, gaining an overview of lifespan concepts and the developmental issues that accompany childhood and adolescence. Due to the program’s degree completion curriculum, students who have already completed upper level coursework in human development are not eligible for admission. Based in Menomonie, University of Wisconsin-Stout is a polytechnic school dedicated to professional training and increased career opportunities for students. The college emphasizes applied learning and 85% of students complete some form of hands-on experiential learning before graduation. UW-Stout’s bachelor of science in human development and family studies is a degree completion program intended for students who already possess an associate’s degree or equivalent and want to progress in the field. For students based in Minnesota and Wisconsin, UW maintains articulation agreements with several local colleges, allowing for maximum credit transferability. Offered entirely online, the degree can be completed with two years of full-time study, though the course scheduling is flexible enough to meet the needs of working students. The program curriculum includes several general education and major courses, along with a selection of concentration and elective courses that allow students to personalize their degree. Located in the city of Pullman — a town by the Idaho border — and with a student population of more than 20,000, Washington State University is one of the largest colleges in the Evergreen state. WSU's bachelor of arts in human development focuses on social policies, educational approaches, and prevention/intervention strategies for the development of families and children. Students in the program analyze the effects of developmental factors including biology, family dynamics, community, neighborhood, and school, applying this knowledge to education programs and initiatives. Learners enrolled in the program prepare for work in both educational and human services settings, from preschools and child care centers to Child Protective Services and family crisis centers. Online students have the option to earn a professional certificate in early childhood education, preparing them for more specialized work in the field. The certificate path includes core courses in child development along with electives in child maltreatment and family stress and coping. North Dakota State University was founded in 1890, and today it's Fargo, North Dakota campus serves over 14,000 students, a significant portion of which are enrolled in online courses. Available in a fully online format, the school's bachelor of science in human development and family sciences program helps students build an understanding of child development in both a familial and societal context. Students in the program can choose from four relevant concentration areas, including family science, child and adolescent development, child development/elementary education, and family science/social work. Broadly, the degree prepares students for either direct service work, such as community service and outreach, or support service work, such as child care directing, human services, and family life education. NDSU's online degree in child development typically takes four years of full-time study to complete, though students can shorten the length by taking summer courses or extra credits each semester. With extra courses, students often complete the degree in three years. Based in the West Texas city of Odessa, the University of Texas of the Permian Basin is a rapidly growing member of the University of Texas system with a current enrollment of over 5,000 students. The University of Texas’ Online Consortium offers a degree completion program, allowing for community college students to earn their bachelor of arts in child and family studies through UTPB. The program is intended particularly for students who have completed Texas Early Childhood Articulate courses or have earned an associate of arts in teaching. Focusing on facets of development both cognitive and physical, this online child development degree gives students the skills both to teach children and improve their quality of life. Many students pursue the degree alongside Texas teacher certification, though UTPB does not offer all required classes for state certification online. However, the degree builds a foundation for students to obtain certification after graduation. Completion of the degree requires 120 credit hours, at least 30 of which must be completed through UTPB. Fresno Pacific University, a Christian-affiliated university established in 1944, offers bachelor’s degrees in over 40 areas of study including 12 online degree programs. FPU’s bachelor of arts in early childhood development provides students with the skills to nurture the development of children in kindergarten through second grade. The program qualifies you to take the California Subject Examination for Teacher (CSET) multiple subjects teaching credential exam, which qualifies you to teach K-6th grades. Students seeking admission to the online childhood development degree program should have completed 60 transferable undergraduate units, two years of college, and have a cumulative undergraduate 2.4 GPA. Coursework explores instructional methodologies and family systems and curriculum, with six credits specific to special education. This 39 unit online child development degree is delivered asynchronously, with classes offered in six or eight-week sessions and can be completed in just 18 months. The University of Alaska Fairbanks is the flagship school of the University of Alaska system, enrolling more than 10,000 students annually. UAF offers a bachelor of arts in child development and family studies with three options for concentration: administration, curriculum and teaching, and family support. The administration path prepares graduates for managerial positions in human services or education, focusing on areas of program development, finance, marketing, and human resources. The program's curriculum and teaching path provides students with the skills to design and implement effective preschool education programs, while the family support path focuses on helping families develop healthy, reciprocal relationships that encourage positive childhood development. UAF offers an associate program in child development that funnels into its bachelor’s program, and students who complete their associate can transfer 23 credits toward the program. UAF's online child development degree requires no campus visits, making it ideal for students based in more rural areas of Alaska. Founded in 1844, Northwestern State University of Louisiana offers over 40 online degree programs, including a bachelor of science in child and family studies with a concentration in child development and family relations. Students enrolled in the child development degree online study family systems theory, infant and child development, and human ecology. The curriculum also explores nutrition, early childhood education, and educational psychology. Applicants must submit ACT/SAT scores and a high school transcript or college transcripts proving you took freshman math and English courses as well as immunization records. Male applicants are also required to provide selective service registration. The 120-credit program requires students complete 90 hours of observation in a childcare facility or elementary school during their sophomore year and a 180-hour internship prior to graduation. All online classes are delivered asynchronously through Moodle, though some courses may require on-campus visits. Over 6,000 students enroll in the 50 online courses at Fort Hays State University. The bachelor’s of general studies degree offers a concentration in child development. FHSU’s general studies major provides an online degree for students whose careers do not require course-specific training or a specialized bachelor’s degree. FHSU’s Virtual College through the Blackboard learning management system administers all online coursework for the bachelor’s in general studies in both asynchronous and synchronous formats. The 120-credit online child development degree includes 21 credits in the concentration, 45 in general education requirements, and 54 in electives. The concentration coursework includes areas of human growth and development, applications for instructional technology, and perspectives on special education and children with exceptionalities. Graduates of the program are prepared for employment as daycare and early childhood providers, teacher aides, and other caregiver roles. This program does not provide licensure to teach in Kansas. A public regional college in Richmond, Eastern Kentucky University maintains six additional branch campuses throughout the state along with a range of online programs. The school offers a bachelor of science in child and family studies with a concentration in child development, available fully online and with courses in convenient eight-week blocks. Featuring studies in child literacy, family stress and resilience, program planning, research analysis, and more, the degree prepares students for positions as teachers, administrators, or education coordinators in private childhood education programs. Online students also perform two early childhood practicum experiences, allowing them to build skills through hands-on work at an early childhood center or related organization. Enrollment in the online child development degree program is open to residents of most states, and students may be able to apply coursework toward state credentials, though out-of-state students should consult an adviser to determine the credit transfer process. Part of the ten-member Concordia University System, Concordia University Saint Paul is affiliated with the Lutheran Church–Missouri Synod. The college was founded in 1893 in Saint Paul, Minnesota, and today serves more than 4,000 students. CSP’s bachelor of arts in child development is an education-focused degree, and admission to the program is only open to students who are already employed in childhood education or possess significant volunteer experience in the field. Focusing on practices for leadership and advocacy in education, the program stresses developmentally appropriate teaching approaches and the family’s role as a child’s primary teacher. Students also gain strategies for creating inclusive, effective learning environments and making ethical decisions in the context of early education. The online child development degree utilizes an accelerated format that requires just 42 credit hours for graduation. Founded in 1888, Utah State University is a major public college in Logan, Utah, about 80 miles north of Salt Lake City. The school is home to more than 28,000 students, with nearly a quarter hailing from outside the state. Available exclusively online, the bachelor of science in family life studies trains students both to improve their own family dynamics and help children and families achieve more fulfilling relationships. Focused on both individual and family perspectives, the degree examines topics in family economics, human development, and consumer issues in relation to development and interpersonal dynamics. Flexible course scheduling and a fully online platform make the degree an ideal choice for new or returning adult students, allowing them to complete the program at their own speed. Courses for this online child development degree are offered in 14-week sessions, with several start dates available throughout the year. Boasting an enrollment of over 16,400 students, the University of North Florida is a public university offering several online degrees. UNF’s bachelor of arts in education in early childhood development prepares students to work in the early childhood sector with confidence. Applicants should have an associate degree or completed a minimum of 60 hours of undergraduate credits with a cumulative 2.5 GPA. The online degree in child development does not lead to teacher certification. Graduates find careers in early childhood settings, in health-related and safety nonprofits, and other agencies, as childcare providers, early learning coaches and as teacher aides. The 120-credit early childhood development degree is delivered asynchronously through Blackboard, except for a field placement practicum arranged with a faculty advisor. If you are already employed at a childcare facility, the practicum may be completed at your place of employment with faculty approval. Located in the historic East Texas town of Nacogdoches, Stephen F. Austin State University is a three hour drive from Dallas (or two from Houston). The school’s bachelor of science in human sciences with an emphasis in human development and family studies is a degree completion program, allowing students who have taken two years of courses at another institution to complete the major at SFA. The program focuses on children, adults, and families, examining growth, development, and change over the course of the human lifespan. The curriculum includes courses on child development, aging, parenting, social policies, consumer problems, and more, and all courses are available fully online. Students earning SFA's online degree in child development also perform a supervised internship at a potential career location, such as an early childhood intervention program or a child life specialist program. The flagship school of the University of Massachusetts system, the University of Massachusetts Amherst boasts a student enrollment of around 30,000 students, making it the largest public college in New England. The college offers online education through its University Without Walls program, which helps working adults earn their degree through fully online coursework. Students earning their child development degree online can even receive up to 100 credits for life experience, including prior coursework, professional certification or training, military training, credit exams, or a portfolio demonstrating relevant experience. The school’s bachelor of arts in children's learning and development gives students the skills to support children and families, preparing graduates for careers in education, administration, youth and family programming, child advocacy, and human services. While the program does not confer a teaching license, advisers can help students prepare for preliminary Massachusetts state licensure exams. Montessori teachers also earn academic credit for previous Montessori trainings. Located in North-Central West Virginia in the city of Morgantown, West Virginia University operates three additional campuses, an online program, and an Extension Service with offices in all 55 state counties. WVU's bachelor of science in child development and family studies focuses on advocacy and leadership for early childhood education, training students to help children develop social, academic, and cognitive skills. The program offers two tracks: preschool education for birth to age 4, which includes Pre-K certification, and child development, which does not include certification. Students in the Pre-K certification track must pass the PRAXIS Core Exam within two semesters of enrollment. Graduation requires a minimum of 120 credit hours, with nine credits devoted to a child development internship/field experience that students perform in public or private child care facility. All courses for the degree are available entirely online, except for a CPR/First Aid requirement, which students may fulfill locally. The University of West Alabama is a public university with more than 50 online programs. UWA’s fully online bachelor’s of science in early childhood development is a non-certification program designed for students interested in working as childcare center directors, childcare providers, preschool teachers, or program administrators. The online degree in child development features a flexible delivery format, with five terms each academic year. Fall and spring terms are eight weeks in duration; summer terms run for six weeks. UWA does not require applicants to submit SAT or ACT scores for admission, just a high school transcript and any college transcripts. Students transferring from a two-year college may transfer up to 60 credit hours, while four-year university students may transfer up to 90 credits. Students enroll in six hours each term and finish the 123 credits required for graduation in 3–4 years. Coursework covers teaching methods and practice, educational psychology and technological applications while also exploring general topics like parenting, family life, nutrition, and games and play. UWA’s curriculum also includes two courses in assessment, diagnosis, and teaching of children with special needs. Point Loma Nazarene University is a Christian-affiliated institution offering undergraduate and graduate education at four campus locations in San Diego and online. PLNU’s bachelor of arts in child development is a hybrid program aimed at students with some college credits but no bachelor’s degree. Applicants must be 23 or older and completed a minimum of 40 undergraduate hours with a 2.75 GPA to apply at PLNU. Students who are 21 with an associate degree or significant work experience may also apply. The BA in child development can be completed in just 15 months depending on your number of transfer credits. You can transfer up to 84 credits into the 120-credit program, with a minimum of 36 completed at PLNU. This online child development degree features courses in parenting, nutrition and health, and special needs. Classes are delivered in a hybrid format with online and face-to-face sessions at any of PLNU’s four campuses. The face-to-face component includes a practicum in an on-site supervised internship. Students create an e-portfolio for presentation and assessment by faculty for the culminating capstone project. Every child development degree online is different. Some focus on one or two specialty areas, while others offer numerous concentrations across different disciplines. Because such variety exists, it's worth spending the time to thoroughly explore potential schools. Below, we've listed some of the most popular concentrations in this field. Biology of childhood: Examination of the biological basis of childhood disease, immunity, and well-being. The course includes discussion of nutrition, contemporary health issues, and the importance of biological information in political, social, and ethical decision-making that affects children. Gender and sexuality development in children: This course explores multiple theories around gender and sexuality development; the biological, cultural, social, and cognitive influences on concepts of gender and sexuality; and best practices to encourage healthy and safe development and expression in young children. Professional partnerships in early childhood education: Students apply their knowledge of physiological and psychological health to the context of child abuse and neglect. The course emphasizes cues to abuse and neglect and the early childhood professional's legal responsibilities to report. Class discussion focuses on advocacy for the student and the profession. Play theory and aesthetics: Learners examine the role of play, art, music, and drama in child development. This course emphasizes the creation of environments that stimulate social skills development, which in turn facilitates growth in self-control, self-esteem, and self-motivation. Observation and assessment in child development: Students learn about appropriate methods for observation and assessment, standardized measures, ethics, and data interpretation. The course emphasizes impartial and unbiased observation, formal and informal assessment, and principles of observational research. HOW LONG DOES IT TAKE TO GET AN ONLINE BACHELOR'S IN CHILD DEVELOPMENT? An online bachelor's in child development requires an average of 120 credits to graduate. Full-time students can generally complete the program in four years. Depending on your circumstances, part-time study may be advantageous, allowing you to take more time to finish your program. Part-time students are usually required to finish the program in 7-10 years. Full-time attendance is required for financial aid eligibility; this is defined as a course load of at least 12 credits per term. A child development degree online is commonly offered as a bachelor's degree completion program. These programs continue the learnings of similar associate curriculums. Students who enter a degree completion program already holding an associate degree can earn the bachelor's degree in two years. In some cases, accelerated degree completion options offer even shorter timeframes to completion. Being accredited means an institution has been vetted by a neutral agency. This process ensures that certain academic standards have been met. Accreditation occurs on the national, regional, or program level, or all three, but each of these accreditations means something different. Though the federal government does not involve itself at the accreditation level, the U.S. Department of Education does provide oversight of the process; it also maintains a database of accredited schools. Similarly, the Council for Higher Education Accreditation is an independent association of accredited degree-granting institutions; it also offers a database of accredited schools. An online degree in child development prepares graduates for many child-centric careers. Individual curricula and concentrations will play a role. We've listed a few of the most common careers below. As a preschool teacher, you will educate and care for children from birth through age five. You'll introduce fundamental concepts of reading, math, and science; create optimum environment for learning; design curriculum; and prepare children for kindergarten. Job responsibilities include assisting classroom teachers by reinforcing lessons in small groups and one-on-one; enforcing classroom and school rules; assisting with recordkeeping, observation, and assessment; preparing lessons; and supervising students outside of the classroom. Social workers are generally employed by government or nonprofit agencies, social workers identify problems that affect communities, families, and individuals. Working with cross-disciplinary resources, social workers solve problems or mitigate them. Daily tasks might include arranging for a family to receive food stamps, referring a teen to counseling, or investigating a claim of child neglect. Responsibilities include supervising youth that are on probation by ensuring that the terms of probation are met, assessing rehabilitation plans, providing rehabilitation resources, monitoring contact with law enforcement, and maintaining case files. Investmenting in a four-year degree can help learners achieve higher earnings and greater career mobility. 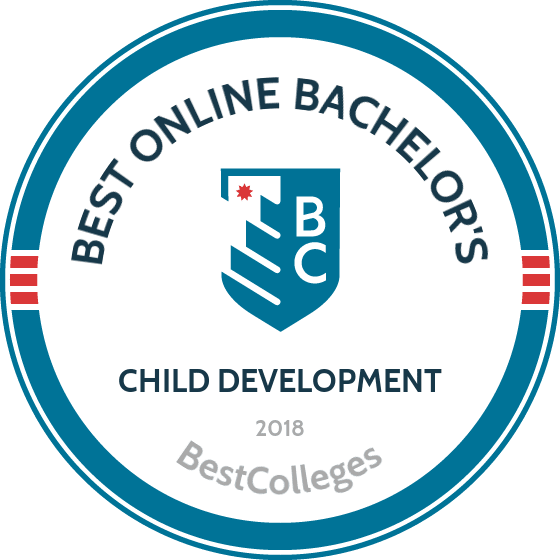 Graduates of the best online bachelor's in child development programs are prepared for roles that correspond to their specialty; in many cases, these graduates hold a competitive advantage over peers who lack a bachelor's degree. The table below illustrates the benefit to preschool teachers who hold a baccalaureate degree. Professional credentials can boost your earnings or provide career advancement. They are not always required by employers, but they indicate that you've met a standard of education and competency in your field. In the child development sphere, there are two nationally recognized professional credentials. Child Development Associate (CDA): The most widely recognized credential in early childhood education, the CDA signifies that the holder has met rigorous standards of competency in the proper methods of nurturing the emotional, physical, intellectual, and social development of children. Certified Child Life Specialist (CCLS): Granted by the Association of Child Life Professionals, the CCLS credential is an examination-based certification. To sit for the exam, candidates must demonstrate completion of a bachelor's degree, ten extra college courses in special content areas, and a 600-hour supervised clinical internship. This credential signifies that the holder has mastered the advanced knowledge and practical application of child life theory. This international organization primarily facilitates research across disciplines involved in child development. The organizations research focus provides great benefit to students, including discounted textbooks, independent research funding, mentoring, networking opportunities, travel awards, and scholarships. NASW, the largest professional organization in this discipline in the world, authors the industry's code of ethics and behavior. Members enjoy professional development opportunities through specialty practice sessions, a job board, access to professional credentials, continuing education, and best practices information. Dedicated to the educational and developmental needs of children from birth through age eight, NAEYC accredits academic programs, lobbies for public policy that benefits young children, and provides resources to early childhood educators. This organization supports the optimal development of children from birth through age eight with developmental delays or disabilities. They also lobby for public policy improvements, provide resources for families and educators, and offer numerous professional development options. Undergraduate students at any accredited university may apply for financial aid by filling out the FAFSA application. The information in this application is used to calculate federal and state need-based awards such as grants, scholarships, and low-interest loans. Students may also qualify for merit scholarships or fellowships offered by a school or a department; there are a wealth of private scholarships available to students who meet eligibility standards. Even if you don't think you qualify for federal financial aid, you must complete the FAFSA to be considered for any monetary award; most schools use the FAFSA data to manage students' financial aid packages.